After docking with the station’s Rassvet module, the Soyuz MS-09 crew—Russian cosmonaut Sergey Prokopyev, NASA astronaut Serena Aunon-Chancellor and European Space Agency astronaut Alexander Gerst—spent a couple hours pressurizing the space between the hatches of the two vehicles. Official hatch opening time occurred at 11:17 a.m. EDT (15:17 GMT) while the outpost was flying some 410 kilometers over the southern Pacific Ocean. The new trio—first Prokopyev, then Aunon-Chancellor and finally Gerst—entered the outpost to join the in-progress Expedition 56 crew, which includes Russian cosmonaut Oleg Artemyev, and NASA astronauts Ricky Arnold and Drew Feustel, with the latter serving as the commander of the ISS. After several hugs and greetings, the now six-person crew moved to the Zvezda service module for a welcome ceremony and video conference with close friends and family, who were at Russian mission control in Moscow. Altair is the call sign for Soyuz MS-09 while Hawaii is the call sign for Soyuz MS-08. After the completion of the welcome ceremony, Commander Feustel was expected to give the new trio a safety briefing and tour of the outpost. Prokopyev, 43, is on his first spaceflight. He was selected to be a cosmonaut in 2010. Before that, he served as a commander in the Russian Air Force. Also on her first spaceflight is 42-year-old Aunon-Chancellor. She was selected to be a NASA astronaut in 2009 after previously working as a flight surgeon for the U.S. space agency. In 2009, she was the deputy crew surgeon for the STS-127 and Expedition 22 missions. Finally, German astronaut Gerst is on his second spaceflight. The 42-year-old first flew into space in 2014 as part of the space station’s Expedition 40/41 increment. During his 165-day mission, he performed a single spacewalk with NASA astronaut Reid Wiseman to replace a failed cooling pump. Soyuz MS-09 launched atop a Soyuz-FG rocket at 4:12 p.m. local Kazakh time (7:12 a.m. EDT / 11:12 GMT) June 6, from Baikonur Cosmodrome. 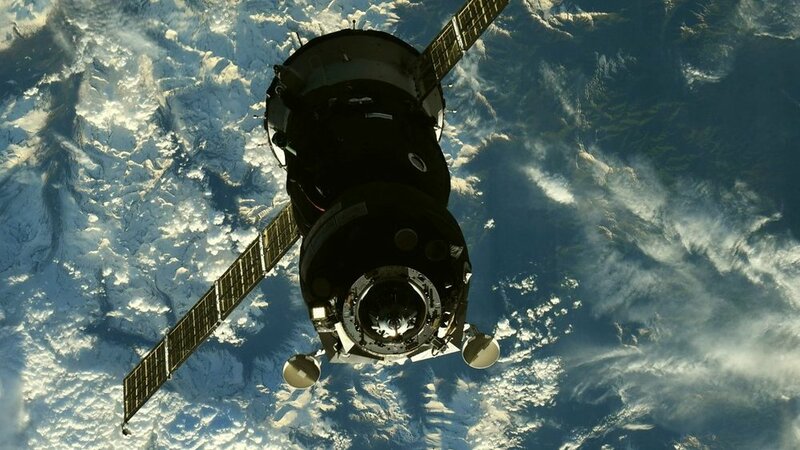 The trio spent 34 orbits inside the tiny Soyuz spacecraft, which only has a livable volume of some 8.5 cubic meters—about the size of a typical walk-in closet—between its two habitable compartments, the descent module and orbital module. Now aboard the ISS, the trio is expected to remain in orbit until December of 2018. When Artemyev, Arnold and Feustel return to Earth in their Soyuz MS-08 spacecraft in early October, Prokopyev, Aunon-Chancellor and Gerst will transition to Expedition 57. For now, it is expected to be a busy summer with several visiting vehicles coming and going as well as at least two spacewalks on the schedule. The first of those spacewalks is currently anticipated to occur next week, June 14. While it will be performed by Feustel and Arnold, it is expected that at least some of the other crew members will support the duo inside the outpost.